Fresh-faced, tech-oriented startups get most of the attention in the modular-building world, but despite their “it” factor, they’re still startups. Is there a market share in modular just waiting for companies with the approach and know-how that come with legacy experience? Chicago-based legacy construction company Skender has been researching modular construction for years and is now getting in the game. In late November 2018, it invited a gaggle of reporters and industry representatives to its 106,000-square-foot factory space on Chicago’s southwest side for a look at its prototype modular apartment. When the new venture is up and running, the company pledges to employ 100 people to produce 2,500 modules per year, at a rate 30 to 40 percent faster and at a cost 10 to 20 percent less than traditional construction. This article originally appeared on Autodesk’s Redshift, a site dedicated to inspiring designers, engineers, builders, and makers. Continue reading the article: https://www.autodesk.com/redshift/modular-construction-companies/. 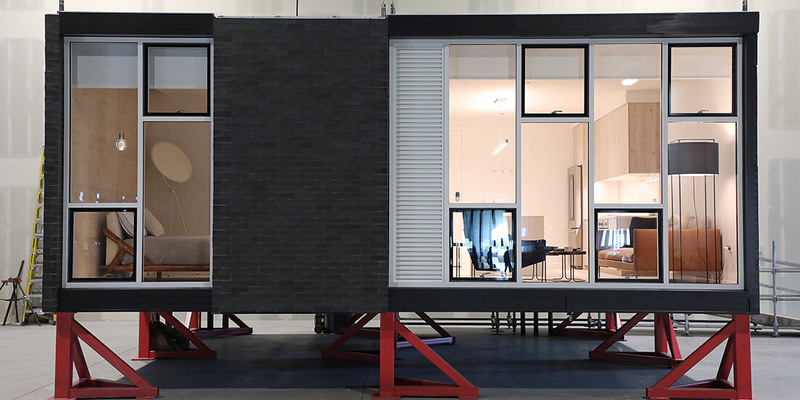 Photo Credit: Skender’s prototype of a modular apartment building it is constructing in Chicago. Courtesy Skender.